There’s a lot of excitement about a class of materials called perovskites that promise to deliver efficient and cheap solar cells. Watching progress in perovskite research is fascinating because perovskites have been able to boost their efficiencies — the percentage of available sunlight that they convert to electricity — more rapidly than any other solar cell material that has been mass produced or being developed in labs. In fact, efficiency figures jumped from around 10 percent to 20 percent in mere two years. In pursuit of lower production costs, one team at the Northern Illinois University recently demonstrated the possibility of replacing gold with nickel to conduct electricity in solar cells. Using nickel, the researchers were able to get 10.4 percent efficiency out of the cell and published the result in the Journal of Physical Chemistry last week. That efficiency isn’t close to the highest that has been reported, but it shows a path to using a cheaper material than gold in solar cells. Meanwhile, other researchers are working with carbon nanotubes as an alternative that doesn’t degrade the performance of the cell. A perovskite film, image courtesy of Oxford PV. So what is a perovskite? The name came from a minerologist, Lev Perovski, and was given to a material discovered in Russia’s Ural Mountains in 1839. That compound was calcium titanium oxide. The perovskite compounds that are being tinkered with to make solar cells aren’t calcium titanium oxide at all, but they do share the same crystalline structure. For example, Oxford Photovoltaics, a U.K. startup that hopes to be among the first to commercialize its perovskite technology, uses organicmetallic halide to create that same crystalline structure. The compound contains methylammonium, lead, iodine and chlorine and can absorb a greater spectrum of sunlight than silicon, the material that makes up over 80 percent of the solar cells on the market today. Yet the reason why the compounds can climb the efficiency ladder so quickly remains a mystery. No perovskite cells have yet to make their market debut, but several companies are in a race to make that happen in the next few years. Finding a gold substitute isn’t the only problem that researchers want to solve. Finding a substitute for the toxic lead is another. Oxford PV has been experimenting with tin. Other candidates include bismuth and cesium. While the best lab cell efficiency has reached 20 percent, making 20 percent cells in mass production will take many more years. Making tens of thousands of cells with consistent quality is a lot harder than creating a few cells in the lab. Scaling up production, which involves designing various pieces of equipment that work well together and being able to troubleshoot production problems promptly, is one of the major hurdles for solar cell manufacturers, regardless of how innovative the technology. 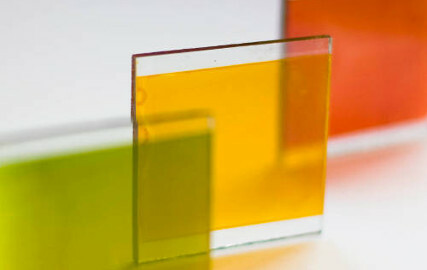 Liquid perovskites, image courtesy of Dennis Shroeder/NREL. Perovskite solar cell developers will have to compete in price or efficiency, preferably both. Several silicon solar makers already are making and selling cells around 20 percent efficiency. SunPower makes 24 percent silicon cells. Finding suitable materials isn’t just about boosting a cell’s efficiency. Proving that perovskite cells can last as long as silicon solar cells, which are expected to still produce 80 percent of what they could generate optimally after 25 years. 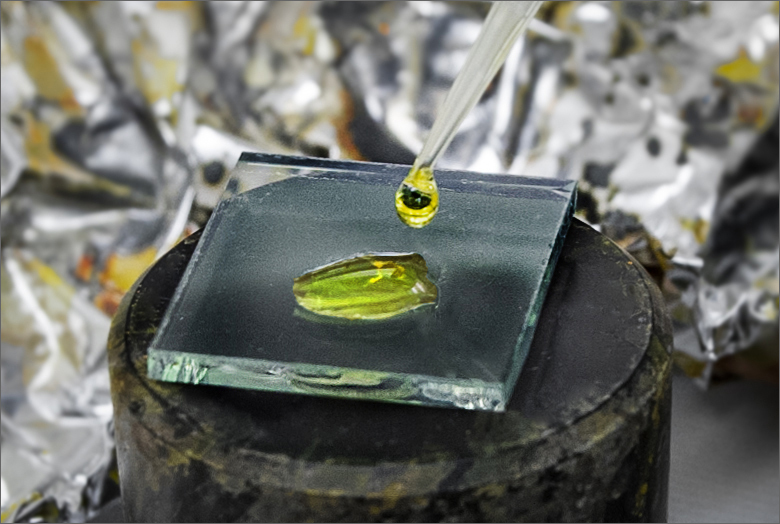 Protecting perovskite cells from moisture, which can significantly lower their performance, is another major challenge. Oxford expects to commercialize its technology in 2017. Dyesol in Australia is aiming for 2018. Terrific developments in solar energy efficiency.